American Contract Bridge League, the sport governing body for bridge in North America - defined as Bermuda, Canada, Mexico, and the United States - and the sponsoring organization of North American Bridge Championships (NABC). Its members are players, grouped in regional districts and local units for some purposes. Contrast USBF. An approach-forcing, natural bidding system, based on a weak NT and 4-card majors, popular in the United Kingdom and the Commonwealth. 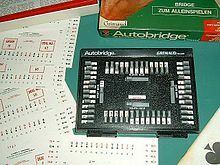 Auction bridge, an earlier form of bridge, replaced by contract bridge owing to changes in scoring methods. A commonly used term for the choice of minor suit opening bid with less than four cards, typically in five card major systems. In Standard American Yellow Card, it is normal to bid the longer suit with 3 cards in one and two in the other, and 1 ♣ with 3-3. In this sense the term is a misnomer as a poor club suit (e.g Jxx) may be opener instead of a stronger diamond suit (e.g. KQx). "Prepared minor" would be more precise terminology. See prepared bid. (Slang) A win by the widest possible margin. At matchpoint scoring, a worse result than any other pair playing the same cards, resulting in an award of zero matchpoints. Also, zero. In a teams competition, one person called the captain must represent a team in stipulated official settings and make stipulated official decisions for a team. A playing captain (pc) is eligible to participate as a player at the table; a non-playing captain (npc) may not play. Many team competitions including WBF world championships limit teams to six players, thus to seven members depending on the kind of captain. Other team officials such as a coach are not team members and are not covered in the rules of bridge. A common conventional agreement following a 1NT rebid, searching for an unbid major suit or a preference to responder’s major. A bid that shows a control in a suit (usually with an ace or king, sometimes with a void), but does not indicate length or strength in the suit otherwise. See control bid. Partnership agreements indicate when in an uncontested auction a bid is considered a cue bid. Usually used in exploring for a slam contract (see Bridge conventions (slam seeking)), or for showing stoppers needed for a notrump game. The earliest dominant bidding system, developed by Ely and Josephine Culbertson. Its principal features were an approach-forcing bidding style, four-card majors, strong two-bids and the use of an honor trick table to evaluate hand strength. Component of a bid that denotes the proposed trump suit or notrump. Thus, there are five denominations - notrump, spades, hearts, diamonds and clubs. The Laws of Contract Bridge (American edition) and Laws of Duplicate Bridge use the term denomination exclusively but "the modern term is strain" according to the sixth edition of The Official Encyclopedia of Bridge. (Abbreviation of Declarative-Interrogative.) 4NT as a general slam try that asks partner to show features. D-I is incorporated in several bidding systems, including Neapolitan, Blue Team Club and Kaplan-Sheinwold. Players distinguish the D-I and Blackwood uses of 4NT by context. The adjustment of matchpoint scores to correct for dissimilar conditions. For example, a game played with a Mitchell movement might have an extra N-S pair, causing a bye round for N-S. The top is therefore lower for N-S pairs than for E-W pairs, and the N-S scores are multiplied by a fraction (or "factor") to make them commensurate with the E-W scores. A contract, bid and made, worth 100 points or more. The undoubled game contracts are 3NT (40 for the first trick + 30 each for the second and third); 4♥ and 4♠ in the majors (4 tricks x 30 points per trick); 5♣ and 5♦ in the minors (5 tricks x 20 points per trick). Game can also be made via a doubled or redoubled contract: e.g., 2♠ doubled is worth 2 x (2 tricks x 30 points per trick) = 120 points. The pair bidding and making the game is awarded a bonus. See bridge scoring. A bidding system dominant in the United States from the 1940s through the 1960s, based on the Culbertson system. The principal difference between the two systems was in hand evaluation: Culbertson used honor tricks to assess a hand's strength whereas Goren used High card points. A method of hand evaluation used in the Culbertson system, which assigns point values to honors and combinations of honors. AK is two honor tricks, AQ is 1½ honor tricks, A or KQ is 1 honor trick, and Kx is ½ honor trick. A bid, usually a sacrifice bid, intended to keep the opponents from playing their presumed or inferred optimum contract. The bidder hopes that insurance premium - the penalty due to the sacrifice bid - will be less than the damage from allowing the opponents to make their contract. A rebid of one's original suit, one level higher than necessary, usually showing a six-card suit: for example, 1♦ - 1♥; 3♦. The range of strength shown by a jump rebid is a matter of partnership agreement: some treat it as a one-round force, others (particularly if playing Kaplan-Sheinwold and the rebid suit is a minor) play it as only a little weaker than a game-forcing opening bid. 2) As direct response (e.g. 1♥ - 2♠): usually, a very strong hand. However, another treatment (weak jump shifts, requiring prior partnership agreement) uses the bid preemptively to show a weak hand and a long suit. A single-elimination tournament for teams-of-four. Routinely each round pairs all of the competing teams in head-to-head matches - win or lose; no draw or tie. Winners advance to the next round and losers are eliminated. The size of the field, or initial number of competing teams, must be a power of two. Only then, the format generates for each round an even number of teams, which enables a complete set of head-to-head matches. The definitions, procedures and remedies that define how rubber bridge and duplicate bridge are played. The Laws include the Proprieties, which discuss the game's customs and etiquette - often far more important than procedural matters. The Laws apply worldwide. Individual sponsoring organizations, such as the ACBL and the EBL, establish their own regulations for play, which may amplify the Laws but may not conflict with them. On defense, to play a higher card, having already played a lower one, so as to convey information to partner. Contrast Echo, or high-low signal. A defensive card that, if retained, is a liability on one line of play, but that, if played, will be missed on another line of play. The deliberate sacrifice of a high card to remove a vital entry to an opponent’s hand, usually the dummy. Named for a ship sunk during the Spanish-American War, to block the entrance to a harbor. Sometimes confused with, and spelled as, the Merrimack, the American Civil War ship that fought the Monitor. See Deschapelles coup. A pairs tournament movement in which the pairs sitting in one direction (usually North-South) stay in the same seats throughout, but after each round the pairs sitting in the other direction (usually East-West) move to the next higher numbered table, and the boards are moved to the next lower numbered table. Unless an arrow switch is performed, the effect is to create two events, a "North-South" contest and an "East-West" contest, with separate winners. A 4-3 trump fit, or a contract with such a trump fit. Named after The Bridge World editor Alphonse "Sonny" Moyse Jr, who wrote and published a variety of articles that promoted the virtues of such fits or contracts, some bidding styles designed to locate them, and some techniques for playing them well. Acronym of "Middle, Up, Down", describing a style of opening lead from three low cards. An ambiguous opening bid of 2♦ that promises one of several different types of hand. 1) A call indicating that the player does not wish to change the contract named by the preceding bid, double or redouble. To pass transfers the right to make the next call to passer's LHO, unless it is the third consecutive pass, which ends the bidding (but see Passed out). A call that doubles penalties if opponents fail to make their currently bid contract. Rewards are also doubled, should the contract succeed. (Slang; chiefly British) See Echo. The term is said to derive from Blue Peter, a nautical signal. A sacrifice bid against a contract that the opponents would not have made. Also, False sacrifice. A bidding system that combines the features of Kaplan-Sheinwold with a strong, artificial 1♣ opening bid. To force out an opponent's trump, usually by means of a forcing defense. An artificial bid that simply requests partner to make a specified cheap reply - commonly the cheapest sufficient bid, or next step. A portmanteau of queen and jack. Used in situations where it does not matter whether the queen or the jack is held or played, as well as to emphasize that it does not matter. The term generalizes to other equals, such as jack and ten. See Principle of restricted choice. A bid of partner's suit at a higher level. A raise shows a fit for partner's suit. 1?-2? is a single raise; 1?-3? is a double raise. 1) The position of an individual card relative to others: Aces have the highest rank, followed by K, Q, J, 10, ... 2. 2) The order of denominations in the bidding. Notrump is highest-ranked denomination, followed by spades, hearts, diamonds and clubs. A higher-ranked suit may be bid at the same level as a lower-ranked suit; the reverse is not true. 1) Second and subsequent bids by the same player. 2) A bid by the same player in a suit he has already bid. A form of knockout competition in which winners advance and losers drop into a secondary event from which some number of top performers return to the primary event. 1) Roman 2♣ and 2♦: Three-suiters. 2) Roman Blackwood, Gerber and Roman Key Card Blackwood (RKCB): Step responses to the ace-asking bid that entail mild ambiguity. 3) Roman jump overcall: Two-suiter. 4) Roman asking bid: A request that partner bid his number of controls wholesale, via step responses. 5) Roman discards: odd-even discards. 6) Roman leads: Rusinow leads. Acronym for Raise Only Non-Force. A treatment used for responding to preempts, usually weak two bids. All bids except the single raise are forcing. A bidding system popular in the U.S. during the 1960s. It features sound opening bids, five-card majors and negative doubles. It is the principle foundation for 2/1 Game Forcing. 1) In the bidding, a sequence of four consecutive calls. 2) In duplicate bridge, a set of boards leading to another round (e.g., the semi-final round), or a set of boards that two pairs play against one another. 3) Of a control, the round on which the control can stop the opponents from winning a trick. An ace, for example, is a first round control; the king is a second round control. 1) Devised by Ely Culbertson. "The total of defensive honor-tricks that will be won at any bid (trump or no-trump) after each deal is about 8 out of the 13 tricks." 2) A way to decide whether to overcall an opponent's 1NT opening. Length in long suits, the losing trick count and HCP are combined. 3) Devised by David Burn from experience of playing with and of captaining teams of junior players. (1) Subtract the number of aces held by opponents from eight. (2) Don't play at that level. When declarer's only high card in the suit lead by the opponents is the ace, count the number of cards in that suit held by declarer and dummy, subtract from seven and duck that many times. To deliberately bid over an opponent's bid, hoping that the cost of a penalty will be smaller than the value of opponent's presumed successful contract. An irregular feature of a Mitchell movement: typically a move by the East-West pairs of 2 tables up instead of the usual 1, to avoid them playing the same boards twice. A Swiss system tournament for teams-of-four. Every team plays a series of matches with a series of opponents whose records or standings are so similar as possible when they face each other, without scheduling repeat matches. Typically these are relatively numerous, relatively short matches. For example of 54 to 56 boards in one day's play: 6, 7, 8, or 9 matches of 9, 8, 7, or 6 boards respectively. 1) (Adjective) (also Teams or Team(s)-of-four) A form of duplicate bridge played by eight people at two tables. The North-South pair at one table and East-West pair at the other table are teammates. Every deal is played at both tables ("duplicate") and scored by comparing the two raw scores - usually on the IMP or board-a-match scale. Matches are commonly played in sets of 6 to 20 deals, with scoring required and player substitutions permitted between sets. 2) The speed at which a player executes a call or play. Some players attempt to intimidate less experienced opponents by playing their cards very quickly. A break in tempo often indicates that a player has an unexpected problem in play. A term for a bidding system combining 5-card majors and a weak no-trump. An inquiry made after opener redbids 1NT. 2♣ is a puppet to 2♦ which says nothing about responders strain. It is just a forcing bid to show an invitational hand. On the other hand, a rebid of 2♦ after a 1NT rebid is an artificial game force. A convention to be used after a sequence like 1X - 1Y - 1NT. Thereafter a 2♣ is a puppet to 2♦, showing a weak ♦ or an invitational hand. A 2♦ bid is game forcing. Also called XY Checkback.